Pocono Township is a township in Monroe County, Pennsylvania, United States. Township government is located in the village of Tannersville, Pennsylvania, near the site of the popular Camelback Water Beach & Ski Area, which is located in Pocono and the adjacent Jackson Township. The top of the ski area is within Big Pocono State Park, which is maintained by resort staff. The population was 9,607 at the 2000 census. According to the United States Census Bureau, the township has a total area of 34.4 square miles (89.1 km2), of which, 34.2 square miles (88.6 km2) of it is land and 0.2 square miles (0.5 km2) of it (0.55%) is water. As of the census of 2000, there were 9,607 people, 3,503 households, and 2,634 families residing in the township. The population density was 280.8 people per square mile (108.4/km2). There were 4,250 housing units at an average density of 124.2/sq mi (48.0/km2). The racial makeup of the township was 90.21% White, 4.10% African American, 0.15% Native American, 1.33% Asian, 0.07% Pacific Islander, 2.25% from other races, and 1.89% from two or more races. Hispanic or Latino of any race were 5.70% of the population. There were 3,503 households, out of which 36.0% had children under the age of 18 living with them, 63.4% were married couples living together, 7.9% had a female householder with no husband present, and 24.8% were non-families. 19.1% of all households were made up of individuals, and 6.2% had someone living alone who was 65 years of age or older. The average household size was 2.73 and the average family size was 3.16. In the township the population was spread out, with 26.1% under the age of 18, 7.0% from 18 to 24, 29.4% from 25 to 44, 26.5% from 45 to 64, and 11.1% who were 65 years of age or older. The median age was 38 years. For every 100 females, there were 98.0 males. For every 100 females age 18 and over, there were 94.6 males. The median income for a household in the township was $46,107, and the median income for a family was $51,018. Males had a median income of $40,990 versus $25,596 for females. The per capita income for the township was $21,452. About 4.1% of families and 6.0% of the population were below the poverty line, including 5.1% of those under age 18 and 6.1% of those age 65 or over. Pocono Township was created as a separate township by a decree of the courts of Northampton County, Pennsylvania in November 1816. 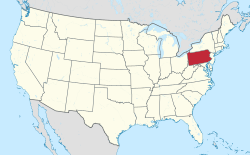 It is bounded on the north by Tunkhannock and Tobyhanna townships, east by Coolbaugh and Paradise townships and west by Jackson Township. It took its name from the mountains which extend across it. Pocono Township comprises 35 square miles (91 km2). In 1830 the population was 564; in 1840 the population was 973; in 1980 the population was 5,772; in 1990 the population was 7,550. The Pocono Manor Historic District was listed on the National Register of Historic Places in 1997. The Swiftwater Inn was demolished in 2007, and delisted in 2010. ^ "Swiftwater Inn, demolished in 2007, was on National Register". Pocono Record. Ottaway Community Newspapers. January 27, 2009. Retrieved January 15, 2010.